Baryshnikov's body is just one of several mediums in this multimedia production and is certainly the most mesmerizing one. 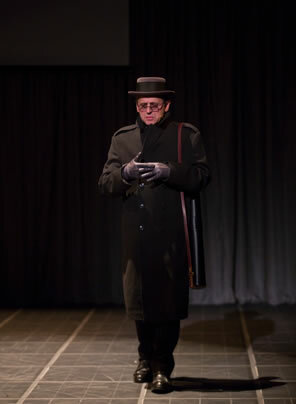 Big Dance Theater and Baryshnikov Productions, Shakespeare Theatre Company, Lansburgh Theatre, Washington, D.C.
Mikhail Baryshnikov as Belikov in the Big Dance Theater production of Man in a Case, Photo by T. Charles Erickson, Shakespeare Theatre Company. The moment comes halfway through this 70-minute show, during the bridge between the two Anton Chekhov short stories adapted here. Five of the seven members of the cast sitting around the table doze off, and Tei Blow, sitting at the far end of the table and serving as the production's soundman, puts on a jazz tune. The seventh member of the cast is Mikhail Baryshnikov, who, in the first half had played Belikov, an uptight school teacher who refuses to dance. But now, Baryshnikov begins dancing an easy soft-shoe across the stage—until Blow disrupts the music with a loud scratch. Baryshnikov looks at him and shrugs: "That's what you were waiting for," he says. Indeed, we were. Baryshnikov is one of history's great ballet dancers. Years and years ago when I watched him on TV, in the Oscar-nominated film The Turning Point (11 nods, including one for Baryshnikov for supporting actor), or matching moves with Gregory Hines in White Nights, Baryshnikov's athletic moves and leaps—he seemed to hang in midair—took my breath away. I have always longed to see him perform in person and never got the chance. Until now when the Shakespeare Theatre Company hosted this Big Dance Theater production of Man in a Case that premiered at Hartford Stage back in the spring. At 65, Baryshnikov is no longer a leaping lord or spinning top—in fact, that short soft-shoe bit is the most outward energy he expends in this production. But he's no less a great talent. Baryshnikov's body is just one of several mediums in this multimedia production and is certainly the most mesmerizing one. Man in a Case also uses projections and various screens in an elegiac presentation of socially stilted men enlivened and ultimately destroyed by love. This is an ensemble piece, too. Jess Barbagallo and Chris Giarmo are avid hunters who serve as narrators and participants in the two tales, "Man in a Case" being the first and "About Love" the second. Tymberly Canale plays the love interest in both stories, and Aaron Mattocks is another of the social gathering who plays Canale's brother in the first half; just his stern appearance which barely cracks even as he enthusiastically plays a tambourine nearly steals the show. Like Blow, Keith Skretch is part of the cast but also serves a technical role as associate video designer. He maneuvers the screens and back- stage curtains on which the projections appear. These projections (plus a half-dozen TV sets in Belikov's apartment) are integral to the presentation, sometimes offering different views of the action on stage, and sometimes—well, maybe not. Just when you think they are live, we see a different scenario. As characters are caught on camera in a snapshot, the photograph on the screen is pulled away by a mysterious hand. It's all puzzling but yet organic in the poetic whole. Furthermore, it serves a practical purpose when the screen and an overhead camera allow us to watch the most amazing dance of the night performed by Baryshnikov and Canale sprawled on the floor. Back to Belikov, the Greek language professor; just his demeanor scares both students and colleagues alike. He falls for the free-spirited Varinka, and the other teachers conspire to get them married, hoping love will loosen up the Greek teacher a bit. But the ultraparanoid and ultimately self-conscious Belikov is first scandalized by a caricature showing him with Varinka in a compromising position, and then he sees her riding a bicycle. That's too scandalous for him, and after a violent confrontation with Varinka's brother, Belikov dies the loneliest of deaths. Of course, there is theatrical irony in the party scenes where everybody dances except Baryshnikov's Belikov; they get him on his feet, but in mere seconds he retreats uncomfortably to his chair. Though he doesn't dance in a traditional sense here, Baryshnikov displays his body control and movement skills in the very stiffness that personifies Belikov: the way he sneaks into his apartment with the Maxwell Smart door of many locks, the way he takes off (and puts on) his shoes and gets into bed, the way he walks like a stick with legs. The way he doesn't dance. Baryshnikov can act (Oscar nom, remember), and though he still has a heavy Russian accent, his first-scene description to the other hunters of shooting a turkey at close range is comic in the mere telling. Yet it is his physical expressions, gestures, demeanor, and walk—all performed as if a tree in the Petrified Forest had suddenly been given life—that comprise the character of Belikov. In "About Love," Baryshnikov himself starts the story of Alehin, who is invited by a local official to dinner where he meets the man's wife, Anna, and falls hopelessly in love with her. The couple keeps inviting him to dinner, and for years he harbors his affections, thinking maybe she is willing to reciprocate. Finally, when the official is transferred to another city and she is boarding a train to follow him, she reveals her love for Alehin—as the train departs. Baryshnikov transforms from narrator to Alehin, and again we see his physical skills come into play, portraying the shy man with a crush. Canale and Baryshnikov play out the secret love—so secret that neither Alehin nor Anna will tell even each other—with their hands at the table. The moment on the train is a series of slow, measured dance moves that ends up with both lying on the stage, moving their limbs in a two-dimensional ballet that's as fascinating as any jeté Baryshnikov executed in his athletic prime. Think of Man in a Case not as a play but as an expressionistic painting. Think of Baryshnikov not as a dancer but as a master of movement—and stillness, too. And think of him as one-seventh of a talented ensemble that moves through motions and emotions like a poem: it's not so much what the words say as how they move.